Philadelphia sports blog— Phillies, Eagles, 76ers and more— with compelling opinion, commentary, and information. Visit daily for unique perspectives and interesting posts on our beloved Philly teams and their leagues— MLB, NFL, and NBA. In 1951, the New York Giants found themselves hopelessly 13 1/2 games behind the arch rival Brooklyn Dodgers in August. Somehow, though, the Giants went on a tear and ultimately clinched the National League Pennant on Bobby Thomson's "shot heard 'round the world" on the season's last day. Recently, former players admitted to an elaborate sign stealing system that may have provided a big boost that season. The scheme was keyed by coach Herman Franks using a telescope behind the center field fence to read opposing catcher's signals to begin a relay process to the batter. 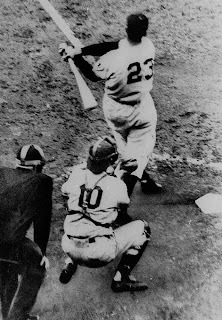 It is unclear whether Thomson was aided by the Franks system, but it seems clear that at a minimum, arguably the most famous home run and moment in baseball history would likely have been reduced to just an exciting way to end the regular season. Eagles- the Eagles Capitalize On QB Riches? Eagles- Where Do the Eagles Go From Here? Phillies- Phillies, Just Say "Thanks, But No Thanks!" Phillies- Hamels and Lidge Need to Find Their "Mojo"
Phillies- What's Going on with Brad Lidge? NLCS 3- Oh, What a Game! After a lengthy career leading businesses in the financial services industry, I took a very different turn several months ago when I launched a new blog site. It is called "I'm Just Saying, Philly" and is primarily dedicated to covering the Philadelphia Sports scene. This site was created for the passionate and knowledgeable fans in the #1 sports city in the country to read about and discuss the teams and players that are a big part of our daily lives. Athletics have been a key element in my life, both participating and following professional and collegiate sports. I have spent many hours between the white lines playing organized and recreational sports, including baseball, basketball, football, fast pitch softball, tennis, bowling, volleyball and golf. Additionally, I have been an avid fan and follower of the Philadelphia Phillies, Philadelphia Eagles and Philadelphia 76ers. More recently since taking up the sport 8 years ago, I have also tracked professional tennis very closely. I am also a "Featured Columnist" for "Bleacher Report" covering the Phillies, Eagles and MLB.